Week 127 and the old Mary Berry Baking Bible is now looking well used and “lived in” and there are few recipes left to choose from but I delved in with a bit more vigor than last week and came out with the last cheesecake recipe from that section and a frosted walnut layer cake. I began with the cheesecake as this a cooked cheesecake which involves several stages. I made the base first and I know Mary is quite lean on the biscuit and butter for her cheesecakes so I doubled the biscuit and butter amounts and melted the butter while crushing the biscuit for the base. I thought this gave a nice base to the cheescake with no gaps or holes. I put it in the fridge to set. Once it was set, I then set off to make the filling. This involved enormous amounts of ricotta cheese, with butter , sugar, flour, lemon and egg yolks all whisked together. Then fold in whipped cream and whisked egg whites and pour onto the biscuit base and bake for about 1 1/2 hours. When cooked, turn the oven off but leave the cheesecake in the oven for a further hour. 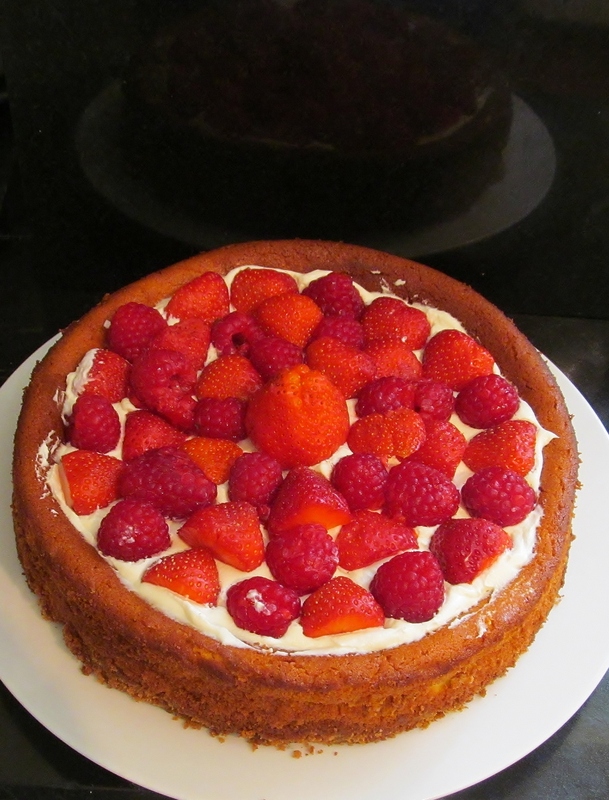 Finally remove the cheesecake from the tin and decorate with cream and summer fruits. The recipe actually called for cooking some redcurrants, blackcurrants and blackberries in 2 tablespoons of water and sweeten to taste and then blend some arrowroot with some cold water and add the fruit and allow to thicken. I chose to keep mine simple with cream, strawberries and raspberries. We haven’t been overly keen on baked fruit cakes but this one was quite nice and would be nice possibly to do again. 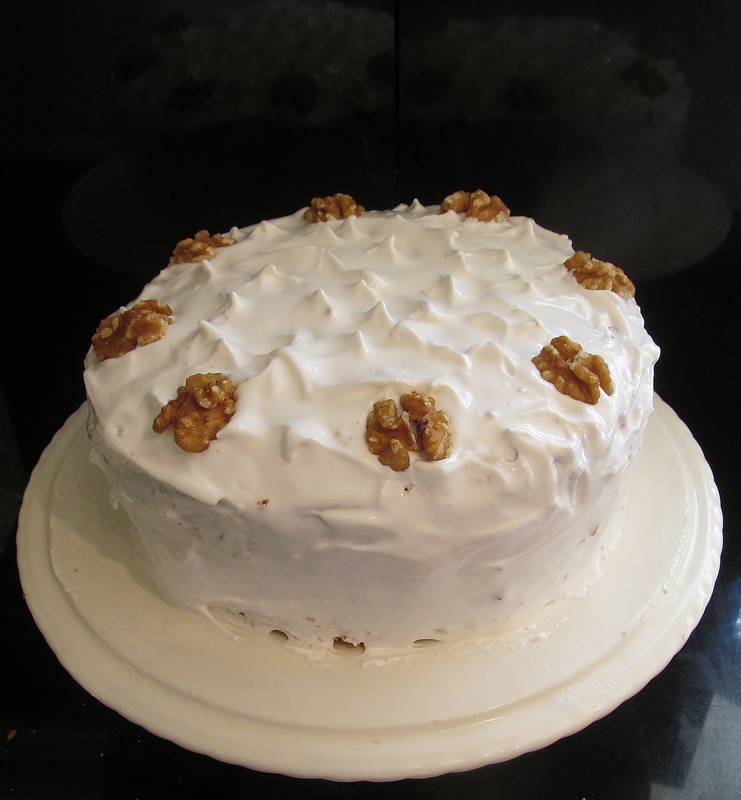 The second recipe was the frosted walnut layer cake. The initial sponge cake was one of Mary’s easy throw everything in a bowl and mix cakes – one of my favourites! Pour into the sandwich tins and bake. Once cooled prepare the frosting. This is where is got a little more complex! Mary asks you to put all the frosting ingredients in a bowl and whisk over a pan of hot water – FOR 10-12 MINUTES!! My poor hand mixer was definately pushed to it’s limits of endurance, as was my wrist! Once the mix forms little peaks, sandwich the layers together with the frosting and then cover the top and sides with it, putting little peaks on the top and decorate with walnuts. Mary tells you to work quickly as the icing sets rapidly. Leave the cake to set in a cool place and enjoy! This was a yummy cake and definately one I would make again.